Yoga, the word, means not just the practice of yoga, but yoga itself: the psychospiritual state of complete integration. This state is not exclusive to meditating yogis on mountaintops or something that takes a million years to achieve. It is both our birthright and our natural state. When we see past our ego, our mind chatter, and our negative self-talk, we connect with this intrinsic state. We have felt it in moments of bliss; perhaps in front of a piece of artwork, on a beautiful beach, or in the presence of a loved one. When our ego mind gets out of the way…even for a moment, our connection to yoga arises. The benefit of developing a sadhana is that you create the condition for this connection to yoga to arise more often. You are not so much doing yoga practices, as you are practicing the yoga itself. Conscious — This is a commitment to staying aware and present throughout the experience. No going on autopilot or doing rote movement or activities where your mind slips into something else and you are not engaged. Spiritual — Yoga practice is a spiritual practice. While it doesn’t have any inherent hold on what you call “spirit” or how you relate to it, it does as for a recognition that *something* bigger is going on here. We’ll talk more about this throughout the course; this is just a primer to get your wheels turning on what it means for you to develop a spiritual connection. Practice — This means every damn day. Think of every expert in any field…none of them dabbled in their area of expertise, they went for it full force and stuck to it, often for many years, before it bore fruit. Likewise, consider a garden. One cannot plant seeds, walk away, and return in the fall to hope for an abundant crop. We have to show up every day…not just to watch things bloom, but to pull the weeds, too! All three of these elements must be present for our yoga practice to become a sadhana, something that takes us beyond the daily doldrums of life elevates our mind and connects us to spirit. This kind of practice sets the stage for a fundamental shift in our perception and way of life. It may take some time to get there, but every step of the way brings us closer to making the state of yoga our new normal. This week in my Facebook Live we talked about Yoga Psychology: Taking Your Yoga Beyond the Mat and Developing a Daily Sadhana. I talked about why it’s so important to create a personalized daily practice and steps you can take to develop your own practice. My book, Yoga Beyond the Mat, guides you step-by-step through making yoga your daily spiritual practice. Using the principles of yoga psychology, this book presents practical, revolutionary tools that work, and take you beyond the mat into the heart of this ancient tradition…but with a modern twist. 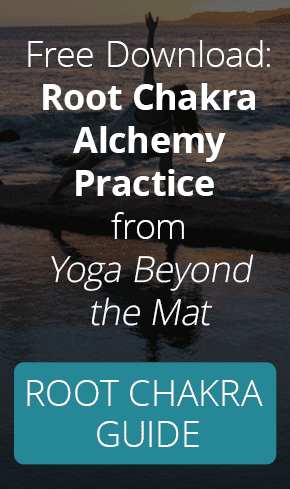 If you prefer an online course, Yoga Beyond the Mat: Making Yoga Your Daily Spiritual Practice, guides you through how to empower ourselves in our practice and commit to a daily sadhana, where we knowingly changing our lives and foster our connection with yoga.